Home > News & Blogs > Brain Injury > How can technology help people who have suffered a brain injury? There are a large number of different types of brain injuries, of varying levels of severity. Causes of brain injuries include conditions such as stroke, tumours, brain haemorrhages and encephalitis. The injury may affect just one area of the brain or several areas of the brain. If you or someone you know has suffered a brain injury, they may experience difficulties moving and walking, communicating, manual dexterity, blindness / low vision or deafness/ hearing issues. There are a number of different types of appliances which can assist individuals who have suffered a brain injury, to improve or maintain their capabilities. 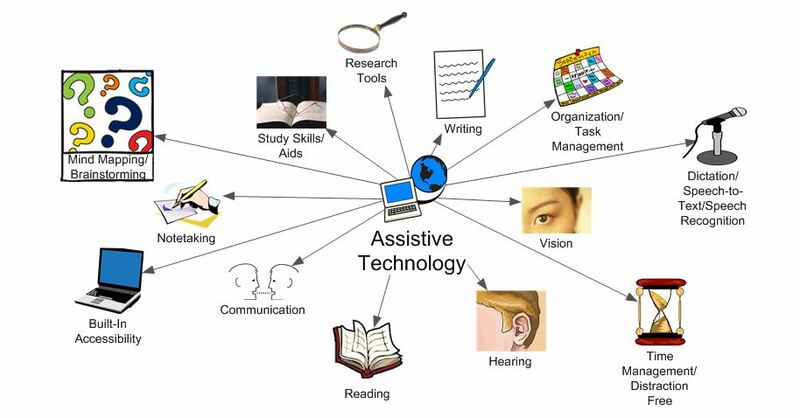 Assistive technology (often abbreviated as AT) is an umbrella term which may be used to describe any item, piece of equipment or software which is used by a person who has a disability or brain injury. AT can have a huge impact on an individual with a brain injury as it can increase their involvement in aspects of daily living and independence by enabling an individual to perform a task which they wouldn’t otherwise be able to accomplish. Different people will require different types of AT, depending on their injury and needs. There are a number of different types of AT’s to assist a range of disabilities such as mobility impairments, visual and hearing impairments and cognitive impairments. Technology devices to assist attention, memory, self-regulation, navigation, emotional recognition and management to assist cognitive processes. If an individual has suffered a brain injury, they may have a professional carer or speech language therapist, occupational therapist, vocational therapists and/or another type of professional who can assist them with choosing the correct technology to assist their individual needs. Technology is a rapidly changing and growing area. As technology is evolving, the use of robots and technology in health care has also developed and there have been a number of advancements in robotic technology which have been used in rehabilitation therapy for disabled individuals, which may assist both cognitive injury and paralysis. Such examples include a robotic exoskeleton which is the first of its kind, which may assist those who suffer from a spinal and neurological injury. As part of a new technology being developed by researchers in Germany and Korea, the exoskeleton is a two-armed, robotic device which fits around a man’s hips and legs. There is another part which is a dark cap on the individual’s head, covered with electrodes that facilitate the connection between the brain and the machine. The device allows a full range of movement, delivering full upper-body rehabilitative therapy using natural motion and customizable pressure and force. Scientists think that the new mind-controlled device could one day be used by people who cannot walk. If you or a loved one has suffered a brain injury as a result of clinical negligence we may be able to assist by claiming compensation to pay for aids or equipment recommended by a specialist. If an interim payment is obtained then if appropriate the money may be used to pay for specialist therapy, and / or to buy the aids, equipment, or specific technology which a specialist independent expert has recommended. Ipek Tugcu is an Asscitate solicitor at Bolt Burdon Kemp specialising in Medical Negligence claims. If you or a loved one are concerned about the treatment you have received, contact me free of charge and in confidence on 020 7288 4849 or at IpekTugcu@boltburdonkemp.co.uk for specialist legal advice. Alternatively, you can complete this form and one of the solicitors in the Brain Injury team will contact you.